I am not ashamed to admit it. Kelly Gruber is my favourite position player for the Toronto Blue Jays of all time. According to my baseball card, Gruber was “hard nosed and a fine athlete.” Kelly was a five-tool player who could play six positions. The following is my profile on the greatest Blue Jays third baseman of all time. Kelly hails from Austin, Texas and comes from good lineage – his father, Claude King, was a running back with the Chicago Bears, New England Patriots, and Houston Oilers in the mid 1960s and he finished off his career with the Saskatchewan Roughriders in the CFL. Kelly’s mother was a former Miss Texas beauty pageant winner, which is where he most likely got his pretty hair and good looks from (see the photo of his hot mom below). She married Kelly’s step-dad, David Gruber, shortly thereafter and David went on to adopt Kelly. Gruber, sheepishly: A little disagreement at school. Had to straighten things out. Gruber: I pulled a dollar from my pocket at the corner store near school and some change fell out. A guy from a construction gang was there and he put his foot over a quarter. ‘My two bits,’ I told him. He asks me if it’s got my name on it. I ask him if it’s got his on it. Then I told him I’d give him three seconds to change his mind. The guy goes, ‘1,2,3.’ That’s when I popped him. However, come draft day, the Blue Jays missed the opportunity to draft Gruber in favour of Garry Harris, who lasted only three years in the minor leagues. Cleveland went on to scoop Kelly up with the 10th pick of the first round, and immediately assigned Gruber to Batavia of the New York Penn League. (Incidentally, future Blue Jays manager John Gibbons was taken 14 picks later by the Mets). Things didn’t start off so well for Gruber in Batavia. He hit only .217 with 21 errors in 61 games at shortstop. He was raw. Batavia coach Luis Isaac thought Gruber was too quick to be a shortstop and thought it would be prudent to move Gruber to third base. The next summer Gruber ended up in the Class-A Midwest League, playing for the Waterloo Diamonds. Gruber hit .290, with 43 of his 133 hits counting for extra bases. He still led the league in errors committed by a shortstop, but also had more put-outs and assists than any other at the position. Things were looking rosy for Gruber as he headed to Double-A Chattanooga, little did he know things were actually about to get rocky. In Chattanooga, Gruber struggled with fielding errors yet again due to his wild, unpredictable arm. He had a miserable .918 fielding percentage. Even worse, Gruber committed one of baseball’s cardinal sins: he took his problems in the field with him to the plate. His average plunged to .243 with 13 HR and 54 RBI. In Gruber’s 4th season of professional ball, he was moved off shortstop to third base after five games. As a member of the Triple-A Buffalo Bisons, Gruber played for a manager who treated him like he was “something the dog dragged home.” Bisons Manager Al Gallagher advised the Indians that Gruber had bottomed out as a prospect following a seaso in which he hit .263 with 15 HR and 54 RBI – his first Triple-A season. Gruber was at a crossroads after scuffling in the minors for four seasons. He began to doubt whether he would ever make it to “The Show” at all. As luck would have it, Gallagher’s scathing report on Gruber’s potential was responsible for the Indians’ decision to leave him exposed in the Rule 5 Draft. Following Kelly’s selection by the Blue Jays in the Rule 5 draft, a nervous Gruber arrived to spring training in Dunedin with trepidatin. As a Rule 5 pick, he was afraid he would be viewed as an intruder on his new team. However, that anxiety was quickly squashed as Gruber found that platoon partners Rance Mulliniks and Garth Iorg went out of their way to make Kelly feel welcome and a part of his new team. Mulliniks and Iorg provided advice, showed Gruber different hitting and fielding techniques, and stayed behind when Kelly asked to take extra ground balls – things that Kelly would end up using to beat both Mulliniks and Iorg out of full-time jobs one day. With the help of Mulliniks and Iorg, Gruber made the team out of spring training – mostly due to the fact that the Blue Jays did not want to return him to Cleveland. (One of the stipulations in the Rule 5 draft is that the claimed player must be put on the claimant’s 25-man roster for the entire major league season or be returned to the original team). Kelly made his major league debut April 20, 1984 in front of 37, 231 fans at Exhibition Stadium. Little did the Blue Jays brass know that at the end of the spring, Gruber tried to impress management by swiping a bag headfirst, resulting in a dislocated his index finger. While Gruber was able to yank the finger back into its socket, he could not make a throw or swing a bat without considerable pain. Not long after Gruber’s debut, he was sent down to Triple-A Syracuse through a deal worked out with Cleveland that sent catcher Geno Petralli to the Indians in exchange for Gruber’s rights. At Syracuse, Gruber heated up as his index finger healed. Thanks to the lessons learned from Jimy Williams and Cito Gaston at the major league level, Kelly went on to hit .269 with 21 HR and 55 RBI in only 97 games. He led the International League with a .500 slugging percentage. Every once in a while he’d jolt one 420 feet. Then he’d go 15 feet in the hole behind third, field a ball and toss the runner out by 10 feet. He surprised a few people, me included. Far as being a white guy, he was super-quick laterally. Powerful too. Shoot, he hit 21 HR one year in no time at all. You knew he was going to be some kind of player. Thanks to the strong finish, Gruber was a late September call-up. He arrived during the Blue Jays’ road trip to Fenway Park in Boston. In Gruber’s first appearance, pinch hitting for Rance Mulliniks against Red Sox reliever Al Nipper, he collected his first major league hit in style. Nipper hung a slider and Gruber deposited it into the netting over the Green Monster in left field for a home run. It was September 25, 1984. 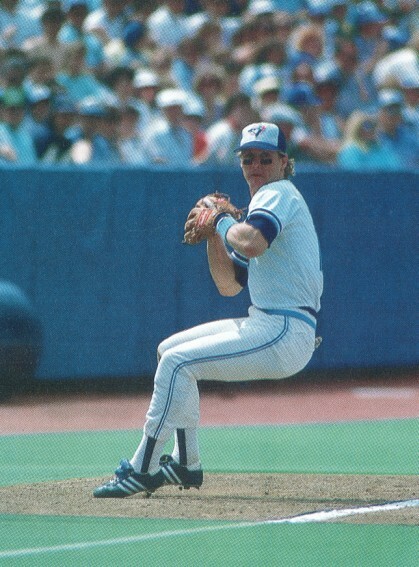 Gruber bounced between Syracuse and a utility role with the Blue Jays for the next couple of seasons until Garth Iorg was released in 1987. With increased playing time for Gruber, the mentor-mentee relationship he had with Rance Mulliniks intensified. From Rance’s instruction, Kelly turned the proverbial corner during the 1988 season, hitting .278 with 16 HR and 81 RBI. On April 16th, 1989, Kelly Gruber was the first Blue Jay in history to hit for the cycle. He also played in 158 of the club’s 162 games, all while playing six positions: third base, shortstop, second base, centrefield, left field, and right field. He had finally arrived. 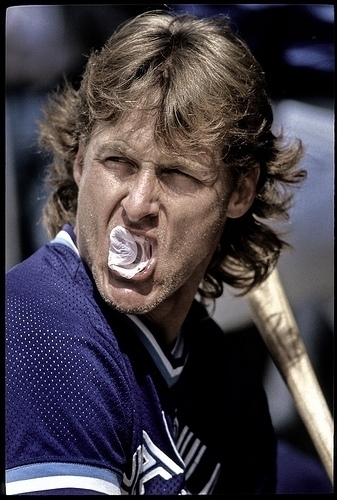 Gruber was nicknamed “Xanthos” by the local Toronto media for his blonde hair; the ladies of Toronto loved his luscious locks. Gruber was voted Toronto’s most eligible bachelor by his legions of mostly female fans. 1990 would be Kelly’s “career year.” He led all third basemen with 31 HR, 118 RBI and had 14 stolen bases to cap it off. He finished second in the AL in total bases with 303 and extra base hits with 73. He finished 4th in MVP voting, was voted an All-Star, and won both the Silver Slugger and the Gold Glove award in the same season. He also won the 19th annual Super Stars Competition in Cancun, Mexico – the first ever baseball player to do so. As a result, the Blue Jays rewarded Gruber with a 3-year $11 million contract. Unfortunately, injuries began to hamper Kelly at the beginning of the 1991 season. Gruber tore a ligament in his hand due to his “hard nosed” style of play. He was only able to appear in 113 games and his power and average declined as well. In 1992, knee and ankle injuries were responsible for a statistical nosedive – Gruber hit a paltry .229 in 120 games. During this time, Kelly was beginning to experience neck pain. Unbeknownst to Gruber at the time, the cause of the neck pain would later be revealed to be a bone spur growing into his spinal cord. The swing that changed everything for Kelly Gruber came late in April of 1992 in a game against Kansas City at the SkyDome. Ironically, the Blue Jays’ best season would become Kelly Gruber’s worst. He was hitting .300 when he took that fateful swing, felt something pop in his neck and thus began his slow, painful decline. After that pivotal swing in April 1992, he says, he kept playing but he knew something was terribly wrong. “I remember when we played in Texas in ’92, my brother-in-law would cradle my head and neck as I got out of bed in the morning. Otherwise, I’d hold onto my head and put my it on top of my shoulders and sit there ’til I got some stability. It was that bad. However, 1992 was the Blue Jays’ first appearance in the World Series. Gruber rose to the occasion. The 1992 World Series was a memorable one for Kelly Gruber for a few reasons. Firstly, Gruber caught the final out in Game 2 to give the Jays a dramatic 5-4 victory. Gruber gave the Braves’ fans their own tomahawk chop after catching the ball, causing considerable controversy. But Game 3 was perhaps the most memorable of all. Gruber was involved in one of the most spectacular and controversial plays in history. 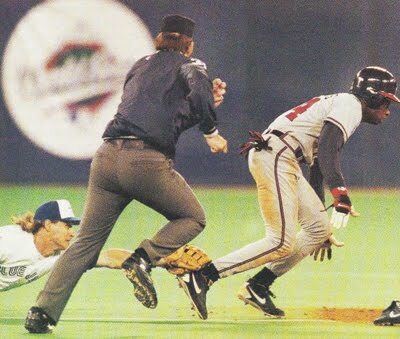 The Blue Jays had appeared to have made only the second triple play in World Series history, when Gruber — a third baseman — appeared to tag Deion Sanders near second base. “Devon White (Blue Jay centrefielder) went back and made a catch that made Willie Mays’ catch look like child’s play,” Gruber said. Meanwhile, Terry Pendleton, who was on first, took off thinking the ball was going to drop. He accidentally passed Sanders, who was trying to return to second. Then something weird happened — the umpire was a nice guy. Little did Blue Jays fans know that on the play, Gruber mangled his shoulder and tore his rotator cuff. He couldn’t lift his arm more than six inches off his side after the play. That didn’t stop him from hitting the game-tying home run in the eighth inning — after having the longest post-season hitting drought at 0-for-28. The Blue Jays went on to win Game 3 and eventually the World Series. In 1993, Gruber’s bone spur became worse and impacted his play a great deal. The Blue Jays looked to off-load the injury-plagues Gruber and traded him for Luis Sojo of the Anaheim Angels and Kelly immediately he landed on the 60-day disabled list. Later, upon discovering Gruber’s neck and shoulder problems, the Angels would protest that Toronto had sold them damaged goods. League president Bobby Brown investigated and rejected the complaint. During five hours of surgery in Los Angeles, Dr. Robert Watkins made no mistake as he fused a piece of bone from Gruber’s hip into his neck. It worked. Not only did Gruber have his life back; he also felt vindicated. Finally there was proof that he hadn’t been making it all up. -Source: John Lott’s “Still Scarred, Gruber Tries to Rise again” July 15, 1997. Although Gruber played briefly with the Angels in 1993, his neck problems sent him into retirement. He did not expect to play again. But each year, he says, major league clubs — including the Blue Jays — would call to inquire about a comeback. After the 1995 neck surgery, he was simply relieved that he could look forward to “an active life after baseball.” But as he started to feel better, and the calls kept coming, that old baseball itch returned. Finally, in December of 1996, Gruber signed a minor-league contract with the Baltimore Orioles – led by his old general manager, Pat Gillick. The Orioles envisioned Kelly as their second baseman, which is the position he played in spring training (I wish I had some footage of Gruber turning-two with Cal Ripken, it would have been magic!). Gruber hit .238 in the spring, going 10 for 26 after a 0-for-16 beginning. He was the Orioles’ last cut in spring training. They said he needed at least 100 at-bats in Triple-A ball to get up to speed. After reaching the magic 100 number, Gruber was hitting .290. But Baltimore, a legitimate playoff contender, didn’t have a roster spot for him. Maybe – he thought hopefully – he’d be traded to team that did. It didn’t happen. Unfortunately, the injury bug plagued Gruber yet again: a strained hip flexor and a strained right shoulder landed him on the disabled list. At the time of the injury, Gruber was hitting .250 in 144 at-bats. Soon thereafter, he was sent to Baltimore’s minor-league complex in Florida for rehabilitation. There was no timetable for his return. A hip flexor injury is fairly common among athletes but is often difficult to heal; recovery can take six- to-12 weeks. Gruber’s rehab in Florida did not go well. Late in June, he went home to Texas to rest his injured hip flexor. “It’s just not healing the way we hoped,” Rochester manager Marv Foley said. On July 12, the Baltimore Orioles gave Gruber his unconditional release. -excerpt from John Lott’s “Still Scarred, Gruber Tries to Rise again” July 15, 1997. Since his retirement, Gruber has stayed involved with the game of baseball and kept in touch with the Blue Jays. Kelly coached his son Kody’s senior baseball team, the Austin Black Wings, helping them reach the National Championship. Kelly also stays in touch with the Blue Jays by appearing at various “Flashback Fridays” promotions and participating in Jays Care Foundation events. Below you will find some highlights of Kelly’s playing career. They include the infamous “home run in the fog,” hitting for the cycle, his 2-stolen-base performance at the all star game, highlights from his best years, and the standing ovation he received after breaking the 100 RBI plateau – all narrated by the legendary Tom Cheek. I hope you enjoy them as much as I did! The slamming of Gruber’s face into the ground during the slide above could not have done much to help the bone spur growing into his neck, as you can see from the grimace on his face. Great job, guys. Always pleasant to take a trip down memory lane. I also like in the video where Fred McGriff calls Kelly the “Golden Child.” I am surprised that nickname never stuck. Any idea where I could get the poster of the “alleged” triple play by Kelly Gruber in the World Series?? My favourite player of all time. I loved watching Kelly play. I just wish I had been a bit older to appreciate his skills. Thanks for the bio on him. that was a great article. you obviously spent a lot of time working on it. brought back a lot of memories. those were the days. what passion players had for the game back then. One of the all time great Jays, both on and off the field. As a young lad I met Kelly and a few of his friends after a Blue Jays game while myself, my friend, my brother and my dad were walking back to our car. He was just a genuinely nice guy, and he posed for a picture with us. Thanks for the memories Kelly! I am blessed to have such an awesome brother! Love you Kelly! I love this article. I met Kelly on Sunday at Roberto Alomar’s number retiring ceremony (July 31/11)and he’s so down to earth. I still love the guy. Great write-up, Callum. Provides some overdue explanation of Kelly Gruber’s sub-par performance throughout 1992, and corrects the misconception at the time that he was a ‘soft’ player (which I remember hearing in Toronto that year).